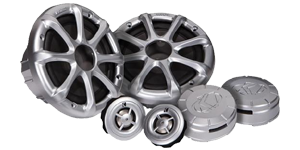 Kicker offers a complete stereo solution for your boat regardless if it is a fishing or a high-powered wakeboarding boat! We have a wide range of marine ready speakers that are all water resistant and can handle just about as much power as you can throw at them. To get the maximum sound quality and performance we recommend pairing the speakers with a Kicker amp!